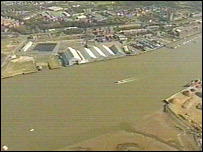 A bid for Chatham's historic dockyard to be given World Heritage Site status is being made by Medway Council. Council leader Rodney Chambers said the move was a "major, forward-looking project that will put Medway on the world map where it belongs". Unesco runs the list of world heritage sites which in the UK includes Maritime Greenwich and Canterbury Cathedral. Making the bid is a three-year project, Mr Chambers said. The official launch will be on 14 June. Mr Chambers told BBC South East that if the bid was successful it could more than double income from tourism in Medway. Heritage director at The Historic Dockyard Chatham, Richard Holdsworth, said: "It's recognition really. "People from the area, people visiting the area will recognise these buildings and structures for what they really are - incredibly important buildings that helped make Britain." Council project manager for the bid, Joanne Cable, said: "Chatham's naval and military installations played a crucial role in creating and supporting Britain's navy, and her global influence. "They form an internationally important legacy that everyone in Medway can be proud of." The proposed site includes Fort Amherst, Upnor Castle, Brompton village and barracks, the Pembroke site's former naval barracks which are now part of Medway's university campus, and the Great Lines. The world heritage list run by Unesco, or the United Nations Educational, Scientific and Cultural Organisation, encourages the identification, protection and preservation of cultural and natural heritage around the globe. It currently comprises 830 sites in 138 countries. The UK proposes one site each year, with bids being prepared locally, but submitted by the government. The next available application date is January 2010.